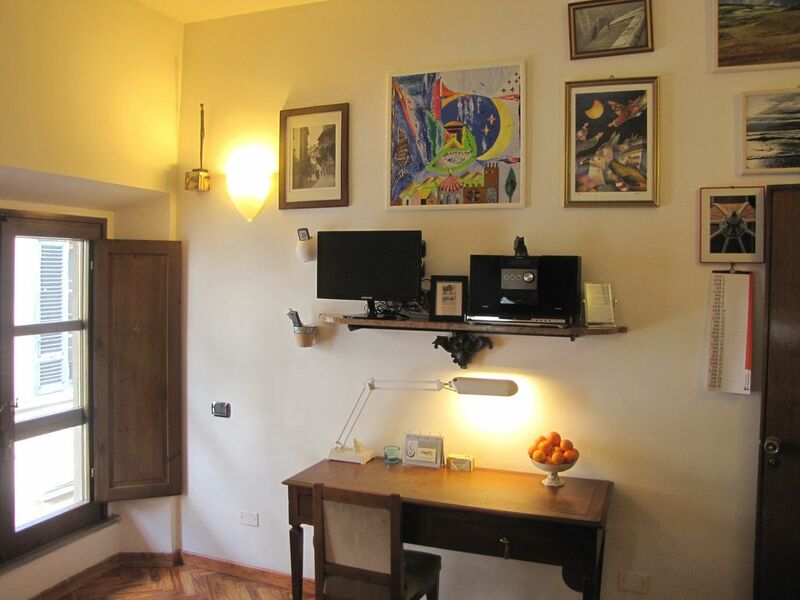 This small studio comfortable for two persons is located on the same street of Michelangelo’s David. It is at few minutes walking distance from the Middle Age and Renaissance masterpieces of the downtown area: the Cathedral with Brunelleschi’s Dome, Palazzo Vecchio and Loggia dei Lanzi in Signoria Square, Uffizi Palace which hosts one of the most important Museum in the world, the churche of San Lorenzo. There are very few places in the world where so many masterpieces and nature beauties are gathered together. The studio is bright and quiet and it is on the 4th top floor of a building with lift and porter. The front of the building maintains its ancient aspect. The apartment has private heating, air conditioned, video house phone, satellite TV and armoured entrance door. It has a hall-room, a kitchenette with electric stoves, a comfortable bathroom with shower and a small storeroom. The floor is an olive wood parquet. The bed is a comfortable double one and its sizes are cm 165 x 190. Internet point ten meters far. Very comfortable lift, suitable for wheelchairs and strollers. On request camp bed for babies (cm 115x60) free of charge. Perfect Location for a Week in Florence! We had a wonderful, total experience with this studio apartment from the moment of enquiry to the actual holiday. Enzo was quick to reply to my booking request and communicated well, sending us a comprehensive document with places of entertainment, art and restaurants that they recommend. Arrangements about where and when to meet were easy and Enzo and his daughter were waiting for us at the appointed time. The apartment itself is a large room full of fascinating, eclectic art and objects with a comfy bed and a small kitchenette cupboard with fridge, 2 ring cooker and sink. All the equipment and towels we required were in place and we were able to prepare some of our meals as and when necessary. The bathroom is huge and clean with a shower, loo and bidet plus a washbasin. Despite only having one window, the room feels light and airy and at night you can shut out the noise of the outside world with the double-glazed windows and shutters. The apartment feels very secure and during the week there is a friendly porter in the entrance lobby. There are 2 lifts available to get to the apartment on the 4th floor which itself has a very secure locking system. It was so lovely to be so close to the centre of the city so that after a busy day walking around, we could pop back for a rest and clean-up before a leisurely stroll around Florence to find one of its many eating establishments. There are small supermarkets very nearby, one of which is open until midnight, so whatever time you arrive, you can pop out for some basic supplies. Apart from the TV, for added entertainment we had an amazing violinist and double bass player playing at the end of the road in the evenings, which we could hear through our open window - we bought two of their CDs so we can relive the wonderful experience now we're back home! Thank you Enzo and Sylvia (I think that's her name!) for a fantastic holiday in your lovely and economically-priced apartment :-) - we really loved it! We are always so happy and satisfied when our guests enjoy their stay in Florence and in our studio. We try to offer them all the best! And we hope to realize this always. Just steps from the Duomo, the apartment is perfect for sightseeing. I particularly enjoyed being able to walk around the cathedral after the daytime crowds had gone. Despite being in the center of things, the apartment is quite peaceful at night. The bed is comfortable and I slept well. Situated on an upper floor, (there is an elevator,) the unit is nice and bright in the daytime. The cooking facilities were handy for breakfasts and simple meals. Communication was good. Before my arrival Enzo sent a list of local tips, and when he and his wife met me at the apartment they answered my specific questions. I had a very enjoyable stay and hope to return! I think you would have a very hard time finding a better place to stay in Florence.The room is small but has everything you need as a couple.We stayed for 4 nights at the beginning of November and it was such a nice quiet spot to come back to after the crowded streets of Florence (even in Nov.) and always felt completly safe.The location is amazing you are literally steps from one of the grandest Cathedrals in the world. Pope Francis arrived at the Duomo the day we left. We were able to watch him pass by (one street over) in The Pope Mobil managed to find a good spot on the fenced off streets with our luggage in tow then only took about 20 minutes to walk to the train even with the crowds.We can't thank Enzo and his wife enough for our wonderful stay.We loved the oranges! The studio is suitable for tourists since they can reach all monuments in few minutes on foot. Excellent restaurants, boutiques, book shops, famous art galleries and antiques are very close. In the meantime you can enjoy the warm and lively atmosphere of San Lorenzo Market, a Liberty covered market, where you can buy typical and fresh food. Medici Palace and San Lorenzo church are in the same area. Bike renting is also possible. Private garage are in the next neighbourhood.